State the aggregate market value of the voting and non-voting common equity held by non affiliates computed by reference to the price at which the common equity was last sold, or the average bid and asked price of such common equity, as of the last business day of the registrant’s most recently completed second fiscal quarter. As of December 30, 2017, the aggregate market value of the registrant’s common stock held by non-affiliates of the registrant was $69.5 million based on the closing price as reported on the NASDAQ. Indicate the number of shares outstanding of each of the issuer’s classes of common stock, as of the latest practicable date: 10,759,680 shares of common stock were outstanding as of September 4, 2018. Certain information is incorporated into Part III of this report by reference to the Proxy Statement for the registrant's 2018 annual meeting of stockholders to be filed with the Securities and Exchange Commission pursuant to Regulation 14A not later than 120 days after the end of the fiscal year covered by this Form 10-K. This Annual Report on Form 10-K contains forward-looking statements in addition to historical information. Forward-looking statements are subject to certain risks and uncertainties that could cause actual results to differ materially from those reflected in the forward-looking statements. Risks and uncertainties that might cause such differences include, but are not limited to those outlined in “Management’s Discussion and Analysis of Financial Condition and Results of Operations—Risks and Uncertainties that May Affect Future Results.” Readers are cautioned not to place undue reliance on forward-looking statements, which reflect management’s opinions only as of the date hereof. The Company undertakes no obligation to update forward-looking statements to reflect developments or information obtained after the date hereof and disclaims any obligation to do so. Readers should carefully review the risk factors described in periodic reports the Company files from time to time with the Securities and Exchange Commission, including Quarterly Reports on Form 10-Q and Current Reports on Form 8-K.
Key Tronic Corporation (dba: KeyTronicEMS Co.) was organized in 1969, as a Washington corporation that locally manufactured computer keyboards. The ability to design, build and deliver a quality product led us to become a leading independent manufacturer of keyboards for computers in the United States. Our fully integrated design, tooling, and automated manufacturing capabilities enabled us to rapidly respond to customers’ needs for keyboards in production quantities worldwide. We supported our sales growth through the development and purchase of international manufacturing facilities. As the computer keyboard market matured with increasing competition from other international providers, we determined that our business could no longer solely rely on keyboard sales. After assessing market conditions and our strengths and capabilities, we shifted our focus from keyboard manufacturing to contract manufacturing for a wide range of products. Our unique strategic attributes are based on our core strengths of innovative design and engineering expertise in electronics, mechanical engineering, sheet metal fabrication and stamping, and precision plastics combined with high-quality, low cost production, and assembly on an international basis while providing exceptional customer service. These strengths have made our company a strong competitor in the electronic manufacturing services (EMS) market. The expansion of the EMS industry and our acquisitions have allowed us to continue to expand our customer base and the industries that we serve. The increase in new programs represents a growing portion of our revenue and a promising foundation for our future. In keeping with our long-term strategic objectives, we have been successfully building a more diversified customer portfolio, spanning a wider range of industries. We currently offer our customers the following services: integrated electronic and mechanical engineering, precision plastic molding, sheet metal fabrication, printed circuit board (PCB) and complete product assembly, component selection, sourcing and procurement, worldwide logistics, and new product testing and production all at competitive pricing due to our global footprint. We differentiate ourselves from others our size and larger in the EMS industry by providing vertical integration, a flexible and responsive approach to our customer’s changing supply demand, and complete design engineering support. We believe that we are well positioned in the EMS industry to continue the expansion of our customer base and achieve long-term growth. Our unique blend of multinational facilities, vertical integration, centralized management, and core strengths continue to support our growth and our customers’ needs. We continue to focus on controlling operating expenses and leveraging the synergistic capabilities of our world-class facilities in the United States, Mexico, and China. This international production capability provides our customers with the benefits of improved supply-chain management, reduced inventory, lower labor costs, lower transportation costs, and reduced product fulfillment time. Given our competitive advantages and the growing pressure for new potential customers to move forward with their outsourcing strategies, we are strongly positioned to win new business in coming periods and grow our revenue and profits. The EMS industry is intensely competitive. Although our customer base is growing, we still have less than 1% of the potential global market and our revenue can fluctuate significantly due to reliance on a concentrated base of customers. We are planning for new customer growth in the coming quarters by securing new programs with new and existing customers, increasing our worldwide manufacturing capacity, leveraging further our design engineering capabilities and continuing to improve our manufacturing and procurement processes and capabilities. Ongoing challenges that we face include but are not limited to the following: continuing to win programs from new and existing customers, balancing capital employed, production capacity and key personnel in support of new customer programs, improving operating efficiencies, controlling costs while developing competitive pricing strategies, and successfully transitioning new program wins to full production. We provide a mix of manufacturing services for outsourced Original Equipment Manufacturing (OEM) products. We provide the following EMS services: product design, surface mount technologies (SMT) and pin through hole capability for printed circuit board assembly, tool making, precision plastic molding, sheet metal fabrication and painting, liquid injection molding, complex assembly, automated tape winding, prototype design and full product assembly. Sales of the majority of our products have not historically been seasonal in nature, but may be seasonal in the future if there are changes in the types of products manufactured. Sales can, however, fluctuate significantly between quarters from changes in customers and customer demand due to the concentration of sales generated by our largest customers. For the fiscal years 2018, 2017 and 2016, the five largest customers in each year accounted for 42%, 42% and 41% of combined total net sales, respectively. We continue to diversify our customer base by adding additional programs and customers. We expect net sales to our five largest customers as a percentage of total net sales to approximate current levels going forward. There can be no assurance that the Company’s principal customers will continue to purchase products from the Company at current levels. Moreover, the Company typically does not enter into long-term volume purchase contracts with it’s customers, and the Company’s customers have certain rights to extend or delay the shipment of their orders. The loss of one or more of the Company’s major customers, or the reduction, delay or cancellation of orders from such customers, could materially and adversely affect the Company’s business, operating results and financial condition. We market our products and services primarily through our direct sales department which is comprised of strategically located field sales people and distributors. We also maintain relationships with several independent sales organizations to assist in marketing our EMS product lines. We have continually made investments in developing and expanding a capital equipment base to achieve vertical integration and efficiencies in our manufacturing processes. We have invested significant capital into SMT for volume manufacturing of complex printed circuit board assemblies and in our metal shop providing precision metal stamping, fabricating, and finishing. We also design and develop tooling for injection molding and sheet metal fabrication and manufacture the majority of plastic and sheet metal parts used in the products we manufacture. Additionally, we have equipment to maintain a controlled clean environment for manufacturing processes that require a high level of precise control. We use a variety of manual and automated assembly processes in our facilities, depending upon product complexity and degree of customization. Some examples of automated processes include component insertion, SMT, selective soldering, flexible robotic assembly, automated storage tape winding, computerized vision system quality inspection, laser turrets, automated switch and key top installation, robotic welding, automated powder coat application, and automated functional testing. Our engineering expertise and automated manufacturing processes enable us to work closely with our customers during the design and prototype stages of production and to jointly increase productivity and reduce response time to the marketplace. We use computer-aided design techniques and software to assist in preparation of the tool design layout and component placement, to reduce tooling and production costs, improve component and product quality, and enhance turnaround time during product development. We purchase materials and components for our products from many different suppliers, including both domestic and international sources. We develop close working relationships with our suppliers, many of whom have been supplying products to us for several years. As part of our long-term strategy, we are committed to supporting our customers by providing research, development, and engineering services. We have recently seen an increase in the success of providing design support on existing and potential customers in differentiating ourselves. These services allow us to facilitate in optimizing new product designs, and the production processes of our customers’ programs. Research, development, and engineering (RD&E) expenses consist principally of employee related costs, third party development costs, program materials costs, depreciation, and allocated information technology and facilities costs. The market for the products and services we provide is highly competitive. There are numerous competitors in the EMS industry, many of which have substantially more resources and are more geographically diverse than we are. Some of our competitors have similar international production capabilities, large financial resources and some have substantially greater manufacturing, research and development, and marketing resources. There is also competition from the manufacturing operations of our current and potential customers, who are continually evaluating the merits of manufacturing their products internally versus the advantages of outsourcing. We believe that we can currently compete favorably in these areas primarily on the basis of our international footprint, responsiveness, creativity, vertical production capability, quality, and cost. Our name and logo are federally registered trademarks, and we believe they are valuable assets of our business. We operate under the trade name “KeyTronicEMS” to better identify our primary business concentration in contract manufacturing in the EMS industry. We consider our employees to be our primary strength and we make considerable efforts to maintain a well-qualified workforce. Our employee benefits include bonus programs involving periodic payments to all employees based on meeting quarterly or fiscal year performance targets. We regularly provide transportation, medical services, and meals to all of our employees in foreign locations. The Company also has defined contribution plans available to U.S. employees who have attained age 21 and provide group health, life, and disability insurance plans. We also maintain share based compensation plans and other long-term incentive plans for certain employees and outside directors. As of June 30, 2018 we had 4,701 full-time employees compared to 5,038 on July 1, 2017, and 4,947 on July 2, 2016. Since we can have significant fluctuations in product demand, we seek to maintain flexibility in our workforce by utilizing skilled temporary labor in our manufacturing facilities in addition to full-time employees. On July 28, 2018 our order backlog was valued at approximately $167.7 million, compared to approximately $126.9 million on July 29, 2017. The amount of backlog is not necessarily indicative of future sales but can be indicative of trends in expected future sales revenue. Due to the relationships with our customers, we will occasionally allow orders to be canceled or rescheduled and as a result it is not a meaningful indicator of future financial results. If there are canceled or rescheduled orders, we typically negotiate fees to cover the costs we have incurred. Order backlog consists of purchase orders received for products expected to be shipped approximately within the next twelve months, although shipment dates are subject to change due to design modifications, customer forecast changes, or other customer requirements. Information concerning net sales and long-lived assets (property, plant, and equipment) by geographic areas is set forth in Note 12, “Enterprise-Wide Disclosures” of the consolidated financial statements of this Annual Report on Form 10-K and that information is incorporated herein. Mr. Gates, age 59, has been President and Chief Executive officer of the Company since April 2009. Previously, he was Executive Vice President and General Manager from August 2002 to April 2009. He served as Executive Vice President of Marketing, Engineering and Sales from July 1997 to August 2002 and served as Vice President and General Manager of New Business Development from October 1995 to July 1997. He joined the Company as Vice President of Engineering in October of 1994. From 1982 to 1991 he held various engineering and management positions within the Microswitch Division of Honeywell, Inc., in Freeport, Illinois, and from 1991 to October 1994 he served as Director of Operations, Electronics for Microswitch. Mr. Gates has a Bachelor of Science Degree in Mechanical Engineering and a Masters in Business Administration from the University of Illinois, Urbana. Mr. Larsen, age 45, has served as Executive Vice President of Administration, Chief Financial Officer, and Treasurer since July 2015. Previously, he was Vice President of Finance and Controller from February 2010 to July 2015. He was Chief Financial Officer of FLSmidth Spokane, Inc. from December 2008 to February 2010. From October 2005 through November 2008, Mr. Larsen served as Controller of Key Tronic Corporation. From May 2004 to October 2005, Mr. Larsen served as Manager of Financial Reporting of Key Tronic Corporation. From 2002 to May 2004, Mr. Larsen was an audit manager for the public accounting firm BDO USA, LLP. He also held various auditing and supervisory positions with Grant Thornton LLP from 1997 to 2002. Mr. Larsen has a Bachelor of Science degree in Accounting and a Masters degree in Accounting from Brigham Young University and is a Certified Public Accountant. Mr. Burkhardt, age 60, has been Executive Vice President of Worldwide Operations of the Company since July 2010. Previously Mr. Burkhardt was Vice President of Worldwide Operations from July 2008 to July 2010 and Director of China Operations and Program Management from January 2006 to July 2008. Mr. Burkhardt also served as Director of Northwest and China Operations from November of 1998 to January of 2006. Mr. Burkhardt also served as Director of Customer Satisfaction from March 1997 to November 1998 and Director of Molding from September of 1995 to March of 1997. Prior to this, Mr. Burkhardt served in other various senior management positions within the Company. Mr. Burkhardt has been with the Company since May of 1989. Prior to joining Key Tronic, Mr. Burkhardt worked for House of Aluminum and Glass for 12 years where he was the plant manager. Mr. Hochberg, age 56, has been Executive Vice President of Business Development since July 2012. Prior to this, Mr. Hochberg served as Vice President of Business Development from October 2009 through June 2012. He was Director of Business Development and Program Management from July 2008 to October 2009. Mr. Hochberg served as Director of Business Development from October 2004 to July 2008 and as Director of EMS Sales and Marketing from July 2000 to October 2004. Prior to joining Key Tronic, Mr. Hochberg worked for Quinton Instrument Company as their Director of Marketing and Product Management from 1992 to 2000. From 1988 to 1992, he was employed by SpaceLabs Medical as their Business Development Marketing Manager. Mr. Hochberg has an MBA from the University of British Columbia, a BA in Psychology, with a minor in Business from Washington University in St. Louis. Mr. Knaggs, age 37, has been Vice President of Quality and Regulatory Affairs since October 2016. Before joining KeyTronicEMS, Mr. Knaggs worked at Telect, Inc. from 2008 to 2016 as their Director of Engineering. Prior to that, he worked at Isothermal Systems Research as Lead Systems Engineer from 2003 to 2008. He has a Bachelor of Science degree in Mechanical Engineering with a minor in mathematics from the University of Washington. Mr. Crispigna, age 57, has been Vice President of Supply Chain of the company since October 2011. Prior to this, Mr. Crispigna held a variety of Materials and Supply Chain positions at Plexus Corporation since 1997, most recently serving as the Director – Supply Chain Solutions from 2005 - 2011. He has a Masters degree in Business Administration, and a Bachelor of Business Administration Degree in Marketing from the University of Wisconsin – Oshkosh. Mr. Crispigna also is a C.P.M., and received his certification in Supply Chain Leadership from the University of Wisconsin. Mr. Mackleit, age 50, has been Vice President of Program Management of the company since July 2012. He served as Director of Program Management from July 2008 through June 2012. From May 2006 to July 2008 he served as Principal Program Manager. Prior to that, he served as Program Manager from March 2002 to May 2006 and Associate Program Manager from August 2000 to March 2002. Mr. Mackleit has also held several other positions with Key Tronic Corporation. Mr. Mackleit has an AA in Business from Spokane Falls Community College and a BA in Business/Marketing from Eastern Washington University. He also holds a MBA from Gonzaga University. Mr. Orebaugh, age 47, has been Vice President of Engineering since April 2017. Prior to this, Mr. Orebaugh served as Director of Engineering since May 2013. From April 2010 to May 2013, he served as Manager of Engineering. From January 2000 to April 2010 he served as Lead Mechanical Engineer. Prior to that, he served as Mechanical Engineer from October 1998 to January 2000 and Associate Mechanical Engineer since October 1997. Mr. Orebaugh holds a BA in Mechanical Engineering from Gonzaga University. Our principal executive offices are located at 4424 North Sullivan Road, Spokane Valley, Washington 99216, and our telephone number is (509) 928-8000. Our website is located at http://www.keytronic.com where filings of our Annual Report on Form 10-K, Quarterly Reports on Form 10-Q or current reports on Form 8-K are available after they have been filed with the Securities and Exchange Commission. The information presented on our website currently and in the future is not considered to be part of this document or any document incorporated by reference in this document. There are risks and uncertainties that could affect our business. These risks and uncertainties include but are not limited to, the risk factors described below, in Item 7A: “Quantitative and Qualitative Disclosures about Market Risk” and elsewhere in this Form 10-K. Component procurement, production schedules, personnel and other resource requirements are based on estimates of customer requirements. Occasionally, our customers may request accelerated production that can stress resources and reduce operating margins. Conversely, our customers may abruptly lower or cancel production which may lead to a sudden, unexpected increase in inventory or accounts receivable for which we may not be reimbursed even when under contract with customers. In addition, because many of our operating expenses are relatively fixed, a reduction in customer demand can harm our gross profit and operating results. The products which we manufacture for our customers have relatively short product life cycles. Therefore, our business, operating results and financial condition are dependent in a significant way on our ability to obtain orders from new customers and new product programs from existing customers. Adverse economic conditions and uncertainty in the global economy such as unstable global financial and credit markets, inflation, tariffs, and recession can negatively impact our business. Unfavorable economic conditions could affect the demand for our customers’ products by triggering a reduction in orders as well as a decline in forecasts which could adversely affect our sales in future periods. Additionally, the financial strength of our customers and suppliers and their ability to obtain and rely on credit financing may affect their ability to fulfill their obligations to us and have an adverse effect on our financial results. We have manufacturing operations located in Mexico and China. A significant portion of our operations are denominated in the Mexican peso and the Chinese currency, the renminbi (“RMB”). Currency exchange rates fluctuate daily as a result of a number of factors, including changes in a country’s political and economic policies. Volatility in the currencies of our entities and the United States dollar could seriously harm our business, operating results and financial condition. The primary impact of currency exchange fluctuations is on the cash, receivables, payables and expenses of our operating entities. As part of our hedging strategy, we currently use Mexican peso forward contracts to hedge foreign currency fluctuations for a portion of our Mexican peso denominated expenses. We currently do not hedge expenses denominated in RMB. Unexpected losses could occur from increases in the value of these currencies relative to the United States dollar. In the past, we have been notified of claims relating to various matters including contractual matters, intellectual property rights or other issues arising in the ordinary course of business. In the event of such a claim, we may be required to spend a significant amount of money to defend or otherwise address the claim. Any litigation or dispute resolution, even where a claim is without merit, could result in substantial costs and diversion of resources. Accordingly, the resolution or adjudication of such disputes, even those encountered in the ordinary course of business, could have a material adverse effect on our business, consolidated financial conditions and results of operations. Refer to Notes 1 and 15 to the consolidated financial statements and critical accounting policies and estimates in management’s discussion and analysis of financial condition and results of operations for further discussion regarding the impairment testing of goodwill and identifiable intangible assets. A decline in general economic conditions or global equity valuations could impact the judgments and assumptions about the fair value of the Company’s businesses and the Company could be required to record impairment charges on its goodwill or other identifiable intangible assets in the future, which could impact the Company’s consolidated balance sheet, as well as the Company’s consolidated statement of operations. If the Company was required to recognize an impairment charge in the future, the charge would not impact the Company’s consolidated cash flows, current liquidity, capital resources, and covenants under its existing credit facilities. Our consolidated financial statements are prepared in conformity with accounting standards generally accepted in the United States, or U.S. GAAP. These principles are subject to amendments made primarily by the Financial Accounting Standards Board (FASB) and the Securities and Exchange Commission (SEC). A change in those policies can have a significant effect on our reported results and may affect our reporting of transactions which are completed before a change is announced. For example, significant changes to revenue recognition rules will be effective for us in fiscal 2019 and we may have material fluctuations in revenue from quarter to quarter once implemented. Changes to accounting rules or challenges to our interpretation or application of the rules by regulators may have a material adverse effect on our reported financial results or on the way we conduct business. The Arkansas facility is currently in the process of moving to a smaller and more cost effective location. The move should be completed by the beginning of December 2018 and the lease on the facility with 175,000 square feet will be terminated. During fiscal year 2017, we closed the Harrodsburg, Kentucky location and transferred customer programs to other facilities in the USA. The facility is currently listed for sale. Additionally, the sale of the building in less than one year is not probable at this time. As such, the property is appropriately being reported in Property, Plant, and Equipment. Commencing on January 1, 2019, the approximate square footage for the Oakdale, Minnesota location will be increasing to approximately 102,914 square feet as we are expanding in our current building. The geographic diversity of these locations allows us to offer services near certain of our customers and major electronics markets with the additional benefit of reduced labor costs. We consider the productive capacity of our current facilities sufficient to carry on our current business. In addition, in Juarez, Mexico one of our buildings includes adjacent vacant land that could be developed into additional manufacturing and warehouse space. All of our facilities are ISO certified to ISO 9001:2015 standard and to Customs Trade Partnership against Terrorism (CTPAT). In addition, the Juarez, Mexico; Shanghai, China and Spokane, Washington facilities are registered/certified to IATF 16949 automotive standard, AS 9100D aviation, space and defense standard, ISO 13485:2016 medical devices, ISO 14001:2015 environmental standard, ANSI/ESD S20.20 Electrostatic Discharge Control Program, OHSAS 18001 Occupational Health and Safety standard, and SA8000 / ISO 2600 social accountability standard. Oakdale, Minnesota is additionally registered to ISO-13485:2016 medical devices standard, AS9100C aviation, space and defense standard, and NADCAP certified. The Spokane, Washington and Juarez, Mexico facilities are additionally registered to ISO/IEC 80079-34 explosive atmospheres. Additionally, Juarez, Mexico is registered by the NSF for water products. The Oakdale, Minnesota; Corinth, Mississippi; Fayetteville, Arkansas and Spokane, Washington facilities are all registered by the U.S. State Department for International Traffic in Arms Regulations (ITAR). We are a party to certain lawsuits or claims in the ordinary course of business. We do not believe that these proceedings, individually or in the aggregate, will have a material adverse effect on our financial position, results of operations or cash flow. Refer to Commitment and Contingencies footnote for further details on litigation in the fiscal year. High and low stock prices are based on the daily sales prices reported by the NASDAQ Stock Market. These quotations represent prices between dealers without adjustment for markups, markdowns, and commissions, and may not represent actual transactions. As of June 30, 2018, we had 671 shareholders of common stock on record. As a result of our credit agreement with Wells Fargo Bank, N.A. we are restricted from declaring or paying dividends in cash or stock without the Bank’s prior written consent. We have not paid a cash dividend and do not anticipate payment of dividends in the foreseeable future. Information concerning securities authorized for issuance under our equity compensation plans is set forth in Part III, Item 12 of this Annual Report, under the caption “Securities Authorized for Issuance under Equity Compensation Plans”, and that information is incorporated herein by reference. 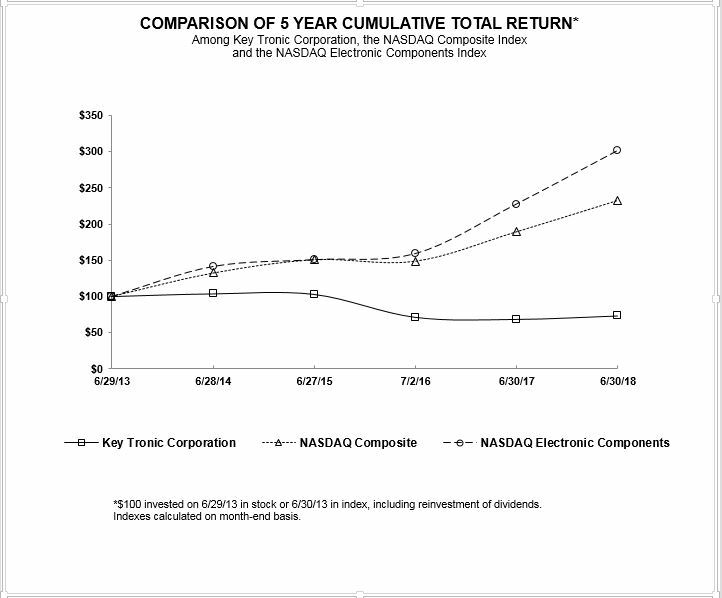 Set forth below is a line graph comparing the cumulative total shareholder return on our common stock with the cumulative total return of the NASDAQ Stock Market (U.S. & Foreign) Index and the NASDAQ Electronic Components Index in fiscal 2018. The following selected data is derived from our audited consolidated financial statements and should be read in conjunction with “Management’s Discussion and Analysis of Financial Condition and Results of Operations,” the consolidated financial statements and related notes, and other information included in this report. Net working capital is defined as total current assets less total current liabilities. Net working capital measures the portion of current assets that are financed by long term funds and is an indicator of short term financial management. Book value per share is defined as total shareholders’ equity divided by the number of shares outstanding at the end of the fiscal year. Reflects the acquisition of Ayrshire on September 3, 2014 in fiscal year 2015 and Sabre on July 1, 2013 in fiscal year 2014. KeyTronicEMS is a leader in electronic manufacturing services and solutions to original equipment manufacturers of a broad range of products. We provide engineering services, worldwide procurement and distribution, materials management, world-class manufacturing and assembly services, in-house testing, and unparalleled customer service. Our international production capability provides our customers with benefits of improved supply-chain management, reduced inventories, lower transportation costs, and reduced product fulfillment time. We continue to make investments in all of our operating facilities to give us the production capacity, capabilities and logistical advantages to continue to win new business. The following information should be read in conjunction with the consolidated financial statements included herein and with Item 1A, Risk Factors included as part of this filing. For the fourth quarter of fiscal 2018, we saw increasing demand from a number of our longstanding customers and most of our new programs, including Skybell Technologies, continued to ramp steadily. We also continued to win significant new business from EMS competitors and from existing customers, including new programs involving medical devices, distribution services and electronic signage. At the same time, our productivity continued to be adversely impacted by industry wide shortages in key components, resulting in delays in delivery and increased costs. Net sales of $446.3 million for fiscal year 2018 decreased by 4.6 percent as compared to net sales of $467.8 million in fiscal year 2017. The decrease in net sales was primarily driven by a decrease in demand from current customers, partially offset by an increase in new program wins. While 2018 was a challenging year, we replaced the revenue shortfall caused by a large former customer, significantly diversified our customer base, reduced our debt by $8.0 million for the year and returned to strong sequential growth in the fourth quarter. Moving into the first quarter of fiscal year 2019, although we continue to face industry supply chain issues, we expect significant growth in revenue and earnings. In preparation, we continue to invest in new equipment and processes to be more productive in our Mexico facilities, and we are expanding and enhancing our profitable US facilities. We’re optimistic about our opportunities for growth in fiscal 2019 and beyond. For the first quarter of fiscal year 2019, the Company expects to report revenue in the range of $118 million to $122 million. Future results will depend on actual levels of customers’ orders, the timing of the start-up of production of new product programs, impact of the new revenue recognition accounting policy and the potential impact of the geopolitical uncertainty. We believe that we are well positioned in the EMS industry to continue expansion of our customer base and continue long-term growth. We continue to diversify our customer base by adding additional programs and customers. Our current customer relationships involve a variety of products, including consumer electronics, electronic storage devices, plastics, household products, gaming devices, specialty printers, telecommunications, industrial equipment, military supplies, computer accessories, medical, educational, irrigation, automotive, transportation management, robotics, RFID, power supply, off-road vehicle equipment, fitness equipment, HVAC controls, consumer products, home building products, material handling systems, lighting equipment and consumer security products. Gross profit as a percent of net sales was 7.7 percent in fiscal year 2018 compared to 8.2 percent for the prior fiscal year. The decrease in gross profit as a percentage of net sales was primarily related to an increase in certain overhead costs partially offset by a decrease in material related costs. The level of gross margin is impacted by product mix, timing of the startup of new programs, facility utilization, and pricing within the electronics industry and material costs, which can fluctuate significantly from quarter to quarter and year to year. Operating income as a percentage of net sales for fiscal year 2018 was 0.2 percent compared to 2.0 percent for fiscal year 2017. The decrease in operating income as a percentage of net sales was primarily due to a decrease in net revenue and a before tax one-time loss of approximately $4.5 million related to the arbitration settlement. Net loss for fiscal year 2018 was $(1.3) million or $(0.12) per share, as compared to net income of $5.6 million or $0.52 per share for fiscal year 2017. The decrease in net income for fiscal year 2018 as compared to fiscal year 2017 was primarily driven by the decrease in net revenue as described above as well as a before tax one-time loss of approximately $4.5 million related to the arbitration settlement. We maintain a strong balance sheet with a current ratio of 2.0 and a debt to equity ratio of 0.30. Total cash provided by operating activities as defined on our cash flow statement was $11.5 million during fiscal year 2018. We maintain sufficient liquidity for our expected future operations. As of June 30, 2018, we had $16.2 million outstanding on our revolving line of credit with Wells Fargo Bank, N.A. As a result, $28.4 million remained available to borrow as of June 30, 2018. We believe cash flow from operations, our borrowing capacity, our accounts receivable sale program, and equipment financing should provide adequate capital for planned growth over the long term. The following table sets forth for the periods indicated certain items of the consolidated statements of income expressed as a percentage of net sales. The financial information and discussion below should be read in conjunction with the consolidated financial statements and notes contained in this Annual Report. The decrease in net sales of $21.5 million from prior year period was primarily driven by a decrease in demand from current customers, partially offset by an increase in net sales from new program wins. We provide services to customers in a number of industries and produce a variety of products for our customers in each industry. Key Tronic does not target any particular industry, but rather seeks to find programs that strategically fit our vertical manufacturing capabilities. As we continue to diversify our customer base and win new customers, we will continue to see a change in the industry concentrations of our revenue. Sales to foreign locations represented 26.2 percent and 22.6 percent of our total net sales in fiscal years 2018 and 2017, respectively. Total cost of sales as a percentage of net sales was 92.3 percent and 91.8 percent in fiscal years 2018 and 2017, respectively. Total cost of materials as a percentage of net sales was approximately 61.1 percent and 61.7 percent in fiscal years 2018 and 2017, respectively. The change from year-to-year is primarily a result of improved pricing of certain raw materials as well as a more favorable product mix. Production and support costs as a percentage of net sales were 31.2 percent and 30.1 percent in fiscal years 2018 and 2017, respectively. The increase in fiscal year 2018 is primarily related to severance expenses related to streamlining the company’s facilities in Mexico. We provide a reserve for obsolete and non-saleable inventories based on specific identification of inventory against current demand and recent usage. We also consider our customers' ability to pay for inventory whether or not there is a lead-time assurance agreement for a specific program. The amounts charged to expense for these inventories were approximately $31,000 and $496,000 in fiscal years 2018 and 2017, respectively. We provide warranties on certain products we sell and estimate warranty costs based on historical experience and anticipated product returns. Warranty expense is related to workmanship claims on keyboards and EMS products. The amounts charged to expense are determined based on an estimate of warranty exposure. The net warranty expense was approximately $74,000 and $68,000 in fiscal years 2018 and 2017, respectively. Gross profit as a percentage of net sales was 7.7 percent and 8.2 percent in fiscal years 2018, and 2017, respectively. The 0.5 percentage point decrease in gross profit as a percentage of net sales during fiscal year 2018 as compared to fiscal year 2017 is primarily related to a 0.6 percentage point decrease in material related costs partially offset by a 1.1 percentage point increase in certain overhead costs. Changes in gross profit margins reflect the impact of a number of factors that can vary from period to period, including product mix, start-up costs and efficiencies associated with new programs, product life cycles, sales volumes, capacity utilization of our resources, management of inventories, component pricing and shortages, end market demand for customers’ products, fluctuations in and timing of customer orders, and competition within the EMS industry. These and other factors can cause variations in operating results. There can be no assurance that gross margins will not decrease in future periods. We took early pay discounts to suppliers that totaled approximately $1.7 million and $1.9 million in fiscal years 2018 and 2017, respectively. Early pay discounts will fluctuate based on our liquidity and changes in the discounts and terms offered by our suppliers. Research, development and engineering expenses (RD&E) consists principally of employee related costs, third party development costs, program materials, depreciation and allocated information technology and facilities costs. Total RD&E expenses were $6.2 million in fiscal year 2018 and $6.4 million in fiscal year 2017, respectively. Total RD&E expenses as a percent of net sales were 1.4 percent in fiscal years 2018 and 2017. Selling, general and administrative expenses (SG&A) consist principally of salaries and benefits, advertising and marketing programs, sales commissions, travel expenses, provision for doubtful accounts, facilities costs, and professional services. Total SG&A expenses were $22.3 million and $22.4 million in fiscal years 2018 and 2017, respectively. Total SG&A expenses as a percent of net sales were 5.0 percent and 4.8 percent in fiscal years 2018 and 2017, respectively. This 0.2 percentage point increase in SG&A as a percentage of net sales is primarily related to an increase in legal fees related to an effort to collect from a former customer through arbitration. We were awarded $6.7 million following the conclusion of a previously disclosed arbitration proceeding, which began in the second quarter of fiscal year 2017. This award resolved a dispute with a former customer involving approximately $9.3 million in inventory purchased and approximately $1.9 million in outstanding accounts receivables and other related fees and costs that we believed to be reimbursable. This event, including all related disposal fees, resulted in an approximately $4.5 million before tax one-time loss to fiscal year 2018. The adverse impact net of taxes on net loss was $3.4 million. We had net interest expense of $2.6 million and $2.3 million in both fiscal years 2018 and 2017. The increase in interest expense is primarily related to an increase in the average balance outstanding on our line of credit. We had an income tax benefit of approximately $(0.1) million during fiscal year 2018 and an income tax expense of approximately $1.6 million during fiscal year 2017. The income tax expense (benefit) recognized during both fiscal years 2018 and 2017, was primarily a function of U.S., federal, state and foreign taxes recognized at the statutory rates offset by the net benefit associated with federal research and development tax credits and changes in potential foreign tax credits. The Company also recognized the impacts of U.S. tax reform, including a provisional estimate related to mandatory repatriation, in the fiscal year ended June 30, 2018. Key Tronic Juarez, SA de CV owns five facilities and leases two facilities in Juarez, Mexico. These facilities include an SMT facility, an assembly and molding facility, a sheet metal fabrication facility, and assembly and warehouse facilities. This subsidiary is primarily used to support our U.S. operations. Key Tronic Computer Peripherals (Shanghai) Co., Ltd. leases two facilities with SMT, assembly, global purchasing and warehouse capabilities in Shanghai, China, which began operations in 1999. Its primary function is to provide EMS services for export. Foreign sales (based on shipping instructions) from our worldwide operations, including domestic exports, were $117.1 million and $105.9 million in fiscal years 2018 and 2017, respectively. Products and manufacturing services provided by our subsidiary operations are often shipped to customers directly by the parent company. The decrease in net sales of $17.2 million from prior year was primarily driven by a decrease in net sales from the former longstanding customer which has been discussed in prior quarters, partially offset by an increase in new program wins. We provide services to customers in a number of industries and produce a variety of products for our customers in each industry. As we continue to diversify our customer base and win new customers we may continue to see a change in the industry concentrations of our revenue. Sales to foreign locations represented 22.6 percent and 28.3 percent of our total net sales in fiscal years 2017 and 2016, respectively. Total cost of sales as a percentage of net sales was 91.8 percent and 92.0 percent in fiscal years 2017 and 2016, respectively. Total cost of materials as a percentage of net sales was approximately 61.7 percent and 63.9 percent in fiscal years 2017 and 2016, respectively. The change from year-to-year is primarily a result of improved pricing of certain raw materials as well as a more favorable product mix. Production and support costs as a percentage of net sales were 30.1 percent and 28.1 percent in fiscal years 2017 and 2016, respectively. The increase in fiscal year 2017 is primarily related absorption increasing as a percentage of sales during the fiscal year. We provide a reserve for obsolete and non-saleable inventories based on specific identification of inventory against current demand and recent usage. We also consider our customers' ability to pay for inventory whether or not there is a lead-time assurance agreement for a specific program. The amounts charged to expense for these inventories were approximately $0.5 million and $0.8 million in fiscal years 2017 and 2016, respectively. We provide warranties on certain products we sell and estimate warranty costs based on historical experience and anticipated product returns. Warranty expense is related to workmanship claims on keyboards and EMS products. The amounts charged to expense are determined based on an estimate of warranty exposure. The net warranty expense was approximately $68,000 and $95,000 in fiscal years 2017 and 2016, respectively. Gross profit as a percentage of net sales was 8.2 percent and 8.0 percent in fiscal years 2017, and 2016, respectively. The 0.2 percentage point increase in gross profit as a percentage of net sales during fiscal year 2017 as compared to fiscal year 2016 is primarily related to a 1.7 percentage point decrease in material related costs partially offset by a 1.5 percentage point increase in certain overhead costs. This reflects an increase in gross margin percentage year-over-year as the unprofitable manufacturing facility was closed and trimming non-profitable programs. We took early pay discounts to suppliers that totaled approximately $1.9 million and $1.9 million in fiscal years 2017 and 2016, respectively. Early pay discounts will fluctuate based on our liquidity and changes in the discounts and terms offered by our suppliers. Research, development and engineering expenses (RD&E) consists principally of employee related costs, third party development costs, program materials, depreciation and allocated information technology and facilities costs. Total RD&E expenses were $6.4 million in fiscal years 2017 and 2016. Total RD&E expenses as a percent of net sales were 1.4 percent and 1.3 percent in fiscal years 2017 and 2016, respectively. Selling, general and administrative expenses (SG&A) consist principally of salaries and benefits, advertising and marketing programs, sales commissions, travel expenses, provision for doubtful accounts, facilities costs, and professional services. Total SG&A expenses were $22.4 million and $22.0 million in fiscal years 2017 and 2016, respectively. Total SG&A expenses as a percent of net sales were 4.8 percent and 4.5 percent in fiscal years 2017 and 2016, respectively. This 0.3 percentage point increase in SG&A as a percentage of net sales is primarily related to an increase in legal fees. We had net interest expense of $2.3 million in both fiscal years 2017 and 2016. We had an income tax expense of approximately $1.6 million during both fiscal years 2017 and 2016. The income tax expense recognized during both fiscal years 2017 and 2016, was primarily a function of U.S., federal, state and foreign taxes recognized at the statutory rates offset by the net benefit associated with federal research and development tax credits and changes in potential foreign tax credits. Net cash provided by operating activities for fiscal year 2018 was $11.5 million compared to net cash provided by operating activities of $9.4 million and $4.6 million in fiscal years 2017 and 2016, respectively. The $11.5 million of net cash provided by operating activities during fiscal year 2018 is primarily related to $1.3 million of net loss, $7.8 million of depreciation and amortization, a $23.3 million increase in accounts payable, $10.6 million decrease in accounts receivable, a $0.6 million decrease in inventory, partially offset by a $4.5 million loss on arbitration. The $9.4 million of net cash provided by operating activities during fiscal year 2017 was primarily due to $5.6 million of net income, $7.2 million of depreciation and amortization and a $4.9 million decrease in inventory, partially offset by a $3.5 million increase in accounts receivable and a $5.9 million decrease in accounts payable. The $4.6 million of cash provided by operating activities during fiscal year 2016 was primarily due to $6.5 million of net income, $6.2 million of depreciation and amortization and an $11.1 million decrease in accounts receivable offset by a $16.2 million increase in inventory and a $2.6 million decrease in accounts payable. Accounts receivable fluctuates based on the timing of shipments, terms offered and collections. In addition, accounts receivable will fluctuate based upon the amount of accounts receivable sold under our Trade Accounts Receivable Purchase Program. During fiscal years 2018, 2017 and 2016, we factored receivables of $104.7 million, $86.5 million and $78.0 million, respectively, from accounts receivable sold to financial institutions, which are not included on our Consolidated Balance Sheets. We purchase inventory based on customer forecasts and orders, and when those forecasts and orders change, the amount of inventory may also fluctuate. Accounts payable fluctuates with changes in inventory levels, volume of inventory purchases, negotiated supplier terms, and taking advantage of early pay discounts. Cash flows used in investing activities were $3.5 million, $8.5 million, and $5.7 million in fiscal years 2018, 2017 and 2016, respectively. Our primary investing activity during fiscal year 2018 and 2017, was purchasing equipment to support increased production levels for new programs. Our primary investing activities during fiscal year 2016 was the purchase of equipment to support increased production levels for new programs as well as the sale and leaseback of equipment. Operating and capital leases are often utilized when potential technical obsolescence and funding requirement advantages outweigh the benefits of equipment ownership. Capital expenditures and periodic lease payments are expected to be financed with internally generated funds and available borrowing capacities. During fiscal years 2018, 2017 and 2016, we received $1.0 million, $0.6 million and $13.3 million of cash resulting from the sale and leaseback of equipment under operating leases, respectively. Cash flows used in financing activities were $8.0 million in fiscal year 2018 and $1.6 million in fiscal year 2017 as compared to cash provided by financing activities of $1.7 million in fiscal year 2016. Our primary financing activities during fiscal year 2018, were repayments on our term loans of $5.9 million as well as borrowings and repayments under our revolving line of credit facility. Our primary financing activities during fiscal year 2017 was the funding of a $3.9 million equipment term loan, repayments on our term loans of $5.4 million as well as borrowings and repayments under our revolving line of credit facility. Our primary financing activities during fiscal year 2016 were repayments on our term loan of $5.0 million as well as borrowings and repayments under our revolving line of credit facility. As of June 30, 2018, the Company had an outstanding balance on the line of credit of $16.2 million. We had availability to borrow an additional $28.4 million under the Wells Fargo line of credit and we were in compliance with our loan covenants. Our cash requirements are affected by the level of current operations and new EMS programs. We believe that projected cash from operations, funds available under the revolving credit facility and fixed asset financing will be sufficient to meet our working and fixed capital requirements for the foreseeable future. As of June 30, 2018, we had approximately $0.3 million of cash held by foreign subsidiaries. Under the Tax Cuts and Jobs Act, future cash repatriations from these foreign subsidiaries are no longer subject to U.S. income taxes, but may be subject to foreign withholding taxes. See additional discussion in Footnote 6, Income Taxes. The total amount of foreign withholding taxes required to be paid for the amount of foreign subsidiary cash on hand as of June 30, 2018, would approximate $27,000. The Company also has approximately $29.5 million of foreign earnings that have not been repatriated to the U.S. Of that amount, the Company estimates that $14.3 million is to be repatriated in the future, requiring foreign withholding taxes of $0.8 million that is currently accrued in our deferred tax liabilities. The remaining $15.2 million is considered to be permanently reinvested in Mexico and China. If these amounts were required to be repatriated, we estimate it would create an additional $1.3 million in foreign withholding taxes payable. The terms of the Wells Fargo Bank N.A. term loans are discussed in the consolidated financial statements at Note 4, “Long-Term Debt.” Principal on the term loan is payable in equal quarterly installments of $1.25 million through June 15, 2019, with final installment of all remaining unpaid principal due on August 31, 2019. The equipment term loan is payable in equal quarterly payments of approximately $0.2 million which commenced on March 31, 2017 and will continue through the maturity of the equipment term loan on June 30, 2021. The terms of the Wells Fargo Bank N.A. revolving loan are discussed in the consolidated financial statements at Note 4, “Long-Term Debt.” As of June 30, 2018, we were in compliance with our loan covenants. We maintain vertically integrated manufacturing operations in the United States, Mexico and China. We lease some of our administrative and manufacturing facilities and equipment. A complete discussion of properties can be found in Part 1, Item 2 at “Properties.” Leases have proven to be an acceptable method for us to acquire new or replacement equipment and to maintain facilities with a minimum impact on our short term cash flows for operations. In addition, such operations are heavily dependent upon technically superior manufacturing equipment including molding machines in various tonnages, Surface Mount Technology (SMT) lines, sheet metal fabrication and stamping machines, clean rooms, and automated insertion, and test equipment for the various products we are capable of producing. As of June 30, 2018, we had open purchase order commitments for materials and other supplies of approximately $36.4 million. Included in the open purchase orders are various blanket orders for annual requirements. Actual needs under these blanket purchase orders fluctuate with our manufacturing levels and as such cannot be broken out between fiscal years. In addition, we have contracts with many of our customers that minimize our exposure to losses for material purchased within lead-times necessary to meet customer forecasts. Purchase orders generally can be cancelled without penalty within specified ranges that are determined in negotiations with our suppliers. These agreements depend in part on the type of materials purchased as well as the circumstances surrounding any requested cancellations. In addition to the cash requirements presented above, we have various other accruals which are not included in the table above. For example, we owe our suppliers approximately $76.2 million for accounts payable and shipments in transit at the end of the fiscal year. We generally pay our suppliers in a range from 30 to 120 days depending on terms offered. These payments are financed by operating cash flows and our revolving line of credit. We believe that cash flows generated from operations, factoring, leasing facilities, and funds available under the revolving credit facility will satisfy cash requirements for a period in excess of 12 months and into the foreseeable future. Preparation of our consolidated financial statements requires management to make estimates and assumptions that affect the reported amount of assets, liabilities, revenues and expenses. Note 1 to our consolidated financial statements describes the significant accounting policies used in the preparation of our consolidated financial statements. Management believes the most complex and sensitive judgments, because of their significance to our consolidated financial statements, result primarily from the need to make estimates about effects of matters that are inherently uncertain. The most significant areas involving management judgments are described below. Actual results in these areas could differ from management’s estimates. Sales revenue from manufacturing is recognized upon shipment of the manufactured product per contractual terms. Upon shipment, title transfers and the customer assumes risks and rewards of ownership of the product. The price to the buyer is fixed or determinable and recoverability is reasonably assured. Unless specifically stated in contractual terms, there are no formal customer acceptance requirements or further obligations related to the manufacturing services; if any such requirements exist, then sales revenue is recognized at the time when such requirements are completed and such obligations are fulfilled. Revenue is recorded net of estimated returns of manufactured product based on management’s analysis of historical returns. Revenues and associated costs from engineering design, development services and tooling, which are performed under contract of short term durations, are recognized only after the completed performance of the service. Inventories are stated at the lower of cost or net realizable value. Cost is determined principally using the first-in, first-out (FIFO) method. We reserve for inventories that we deem inactive, obsolete or surplus. This reserve is calculated based upon the demand for the products that we produce. Demand is determined by expected sales, customer purchase orders, or customer forecasts. If expected sales do not materialize, then we would have inventory in excess of our reserves and would have to charge the excess against future earnings. In the case where we have purchased material based upon a customer’s forecast or purchase orders, we are usually covered by lead-time assurance agreements or purchase orders with each customer. These contracts state that the financial liability for material purchased within agreed upon lead-time and based upon the customer’s forecasts, lies with the customer. If we purchase material outside the lead-time assurance agreement and the customer’s forecasts do not materialize or if we have no lead-time assurance agreement for a specific program, we would have the financial liability and may have to charge inactive, obsolete or surplus inventory against earnings. We also reserve for inventory related to specific customers covered by lead-time assurance agreements when those customers are experiencing financial difficulties or reimbursement is not reasonably assured. We value our accounts receivable net of an allowance for doubtful accounts. As of June 30, 2018, we did not have an allowance for doubtful accounts. As of July 1, 2017, the allowance for doubtful accounts was approximately $0.1 million. This allowance is based on estimates of the portion of accounts receivable that may not be collected in the future. The estimates used are based primarily on specific identification of potentially uncollectible accounts. Such accounts are identified using publicly available information in conjunction with evaluations of current payment activity. However, if any of our customers were to develop unexpected and immediate financial problems that would prevent payment of open invoices, we could incur additional and possibly material expenses that would negatively impact earnings. An accrual is made for expected warranty costs, with the related expense recognized in cost of goods sold. We review the adequacy of this accrual quarterly based on historical analysis and anticipated product returns and rework costs. Our warranty period for keyboards is generally longer than that for EMS products. We only warrant materials and workmanship on EMS products, and we do not warrant design defects for EMS customers. Income tax expense includes U.S. and international income taxes and a provisional estimate for U.S. taxes on undistributed earnings of foreign subsidiaries. We do not record foreign withholding taxes on undistributed earnings of international subsidiaries that are deemed to be permanently reinvested. Certain income and expenses are not reported in tax returns and financial statements in the same year. The tax effect of such temporary differences is reported as deferred income taxes. The deferred income taxes are classified as long-term assets or liabilities. The most significant areas involving management judgments include deferred income tax assets and liabilities, uncertain tax positions, and research and development tax credits. Our estimates of the realization of the deferred tax assets related to our tax credits are based upon our estimates of future taxable income which may change. Stock-based compensation is accounted for according to Financial Accounting Standards Board (FASB) Accounting Standards Codification (ASC) 718, Compensation—Stock Compensation. ASC 718 requires us to expense the fair value of employee stock options, stock appreciation rights and other forms of stock-based compensation. Under the fair value recognition provisions of ASC 718, share-based compensation cost is estimated at the grant date based upon the fair value of the award and is recognized as expense ratably over the requisite service period of the award (generally the vesting period). Determining the appropriate fair value model and calculating the fair value of share-based awards requires judgment, including estimating the expected life of the share-based award, the expected stock price volatility over the expected life of the share-based award and forfeitures. To determine the fair value of stock based awards on the date of grant we use the Black-Scholes option-pricing model. Inherent in this model are assumptions related to expected stock price volatility, option life, risk-free interest rate and dividend yield. The risk-free interest rate is a less-subjective assumption as it is based on factual data derived from public sources. We use a dividend yield of zero as we have never paid cash dividends and have no intention to pay cash dividends in the foreseeable future. The expected stock price volatility and option life assumptions require a greater level of judgment. Our expected stock-price volatility assumption is based upon the historical volatility of our stock which is obtained from public data sources. The expected life represents the weighted average period of time that share-based awards are expected to be outstanding, giving consideration to vesting schedules and historical exercise patterns. We determine the expected life assumption based upon the exercise and post-vesting behavior that has been exhibited historically, adjusted for specific factors that may influence future exercise patterns. If expected volatility or expected life were to increase, that would result in an increase in the fair value of our stock options which would result in higher compensation charges, while a decrease in volatility or the expected life would result in a lower fair value of our stock option awards resulting in lower compensation charges. We estimate forfeitures for all of our awards based upon historical experience of stock-based pre-vesting forfeitures. We believe that our estimates are based upon outcomes that are reasonably likely to occur. If actual forfeitures are higher than our estimates it would result in lower compensation expense and to the extent the actual forfeitures are lower than our estimate we would record higher compensation expense. Long-lived assets, such as property, plant, and equipment are reviewed for impairment whenever events or changes in circumstances indicate that the carrying amount of an asset may not be recoverable. The recoverability of assets to be held and used is measured by a comparison of the carrying amount of an asset to the estimated undiscounted future cash flows expected to be generated by the asset. If the carrying amount of an asset exceeds its estimated undiscounted future cash flows, an impairment charge would be recognized in the amount by which the carrying amount of the asset exceeds the fair value of the asset. Derivatives are recognized on the balance sheet at their estimated fair value. On the date a derivative contract is entered into, the Company designates the derivative as a hedge of a forecasted transaction or of the variability of cash flows to be received or paid related to a recognized asset or liability (a “cash flow” hedge). The Company does not enter into derivatives for speculative purposes. Changes in the fair value of a derivative that qualifies as a cash flow hedge are recorded in “Accumulated Other Comprehensive Income,” until earnings are affected by the variability of cash flows. See Note 11 of the Company’s consolidated financial statements for additional information. Long-term incentive compensation is recognized as expense ratably over the requisite service period of the award which is generally three years. The Board of Directors approve target performance measures for the three year period for each of the Company’s officers and non-employee Directors. Performance measures are based on a combination of sales growth targets and return on invested capital targets. No cash awards will be made to participants if actual Company performance does not exceed the minimum target performance measures. The calculation used to determine the necessary accrual uses a combination of actual results and projected results. We believe that our estimates are based upon outcomes that are reasonably likely to occur. These estimates and assumptions are based on historical results as well as future expectations. Actual results could vary from our estimates and assumptions. In accordance with ASC 350, Goodwill and Other Intangible Assets, goodwill is not amortized but is required to be reviewed for impairment at least annually or when events or circumstances indicate that carrying value may exceed fair value. The Company is permitted the option to first assess qualitative factors to determine whether the existence of events and circumstances indicates that it is more likely than not that the fair value of any reporting unit is less than its corresponding carrying value. If, after assessing the totality of events and circumstances, the Company concludes that it is not more likely than not that the fair value of any reporting unit is less than its corresponding carrying value then the Company is not required to take further action. However, if the Company concludes otherwise, then it is required to perform a quantitative impairment test, including computing the fair value of the reporting unit and comparing that value to its carrying value. The Company utilizes a weighting of the income approach and a market approach in the impairment test. We also consider valuation factors including the Company's market capitalization, future discounted cash flows and an estimated control premium based upon a review of comparable market transactions. Our consideration of discounted future cash flows included assumptions regarding growth rates and margins based on our historical trends. In addition, we applied a market discount rate calculated based upon an analysis of companies similar in size. If our future cash flows do not meet our projections or there is an event that impacts our market capitalization, the assumptions used in our goodwill analysis could be negatively impacted. The estimated fair value of the reporting unit exceeded the carrying value by approximately 38%. We will continue to monitor our market capitalization and impairment indicators. If the fair value is less than its carrying value, a second step of the test is required to determine if recorded goodwill is impaired. In the event that goodwill is impaired, an impairment charge to earnings would become necessary. The Company also has the option to bypass the qualitative assessment for goodwill in any period and proceed directly to performing the quantitative impairment test. We are subject to the risk of fluctuating interest rates in the normal course of business. Our major market risk relates to our secured debt. Our revolving credit facility and term loan are secured by substantially all of our assets. The interest rates applicable to our revolving credit facility and term loans fluctuate with the Wells Fargo Bank N.A. prime rate and LIBOR rates. There was outstanding $16.2 million in borrowings under our revolving credit facility and $18.9 million outstanding on our term loans as of June 30, 2018. See “Management’s Discussion and Analysis of Financial Condition and Results of Operations – Capital Resources and Liquidity” and Note 4 – “Long-Term Debt” to the Consolidated Financial Statements for additional information regarding our revolving credit facility and term loan. Our only material interest rate risk is associated with our revolving credit facility and term loans. During the second quarter of fiscal year 2015, we entered into an interest rate swap contract with a notional amount of $25.0 million related to the borrowings outstanding under the term loan and revolving credit facility. As of June 30, 2018, the remaining notional amount of the interest rate swap contract was $8.5 million. Through the use of the interest rate swap, as described above, we fixed the basis on which we pay interest, thus eliminating much of our interest rate risk. See Note 11 – “Derivative Financial Instruments” to the Consolidated Financial Statements for additional information regarding our derivative instruments. A significant portion of our operations are in foreign locations. As a result, transactions occur in currencies other than the U.S. dollar. Exchange rate fluctuations among other currencies used by us would directly or indirectly affect our financial results. We currently use Mexican peso forward contracts and swaps to hedge foreign currency fluctuations for a portion of our Mexican peso denominated expenses. There was $46.3 million of foreign currency forward contracts and swaps outstanding as of June 30, 2018. The fair value of these contracts and swaps was approximately $(1.2) million. See Note 11 – “Derivative Financial Instruments” to the Consolidated Financial Statements for additional information regarding our derivative instruments. We have audited the accompanying consolidated balance sheets of Key Tronic Corporation (the “Company”) and subsidiaries as of June 30, 2018 and July 1, 2017, the related consolidated statements of income (loss), comprehensive income, shareholders’ equity, and cash flows for each of the three years in the period ended June 20, 2018, and the related notes and schedule (collectively referred to as the “consolidated financial statements”). In our opinion, the consolidated financial statements present fairly, in all material respects, the financial position of the Company and subsidiaries at June 30, 2018 and July 1, 2017, and the results of their operations and their cash flows for each of the three years in the period ended June 30, 2018, in conformity with accounting principles generally accepted in the United States of America. We also have audited, in accordance with the standards of the Public Company Accounting Oversight Board (United States) (“PCAOB”), the Company's internal control over financial reporting as of June 30, 2018, based on criteria established in Internal Control - Integrated Framework (2013) issued by the Committee of Sponsoring Organizations of the Treadway Commission (“COSO”) and our report dated September 10, 2018 expressed an unqualified opinion thereon. Other comprehensive income for fiscal years 2018, 2017, and 2016 is reflected net of tax provision (benefit) of approximately $0.7 million, $2.5 million and $(1.4) million, respectively. Key Tronic Corporation and subsidiaries (the Company) is engaged in electronic manufacturing services (EMS) for original equipment manufacturers (OEMs) and also manufactures keyboards and other input devices. The Company’s headquarters are located in Spokane Valley, Washington with manufacturing operations in Oakdale, Minnesota; Fayetteville, Arkansas; Corinth, Mississippi; and foreign manufacturing operations in Juarez, Mexico; and Shanghai, China. The consolidated financial statements include the Company and its wholly owned subsidiaries in the United States, Mexico and China. Intercompany balances and transactions have been eliminated during consolidation. The preparation of financial statements in conformity with accounting principles generally accepted in the United States of America requires management to make estimates and assumptions that affect the reported amounts of assets and liabilities, disclosure of contingent assets and liabilities at the date of the financial statements, and the reported amounts of revenues and expenses during the reporting period. Estimates include the allowance for doubtful receivables, the provision for obsolete and non-saleable inventories, deferred tax assets and liabilities, uncertain tax positions, valuation of goodwill, impairment of long-lived assets, medical self-funded insurance liability, long-term incentive compensation accrual, the provision for warranty costs, the fair value of stock appreciation rights granted under the Company’s share-based compensation plan and purchase price allocation of acquired businesses. Due to uncertainties with respect to the assumptions and estimates, actual results could differ from those estimates. The Company considers investments with an original maturity of three months or less to be cash equivalents. Cash equivalents are carried at cost, which approximates fair value. The Company may have cash and cash equivalents at financial institutions that are in excess of federally insured limits from time to time. The Company evaluates the collectability of accounts receivable and records an allowance for doubtful accounts, which reduces the receivables to an amount that management reasonably estimates will be collected. A specific allowance is recorded against receivables considered to be impaired based on the Company’s knowledge of the financial condition of the customer. In determining the amount of the allowance, the Company considers several factors including the aging of the receivables, the current business environment and historical experience. After all attempts to collect a receivable have failed, the receivable is written off against the allowance. Inventories are stated at the lower of cost or net realizable value. Cost is determined principally using the first-in, first-out (FIFO) method. Customer orders are based upon forecasted quantities of product manufactured for shipment over defined periods. Raw material inventories are purchased to fulfill these customer requirements. Within these arrangements, customer demands for products frequently change, sometimes creating excess and obsolete inventories. The Company regularly reviews raw material inventories by customer for both excess and obsolete quantities. Wherever possible, the Company attempts to recover its full cost of excess and obsolete inventories from customers or, in some cases, through other markets. When it is determined that the Company’s carrying cost of such excess and obsolete inventories cannot be recovered in full, a charge is taken against income for the difference between the carrying cost and the estimated realizable amount. We also reserve for inventory related to specific customers covered by lead-time assurance agreements when those customers are experiencing financial difficulties or reimbursement is not reasonably assured. Property, plant and equipment are carried at cost and depreciated using straight-line methods over the expected useful lives of the assets. Repairs and maintenance costs are expensed as incurred. The Company records intangible assets that are acquired individually or with a group of other assets in the financial statements at acquisition. In accordance with ASC 350, Goodwill and Other Intangible Assets, goodwill is not amortized but is required to be reviewed for impairment at least annually or when events or circumstances indicate that carrying value may exceed fair value. The Company tests goodwill by first performing a qualitative analysis (“Step 0”) to determine if it is more likely than not that the fair value of the reporting unit is greater than its carrying value. If the Company determines that it is not more likely than not that the fair value of the reporting unit is greater than its carrying value, the Company calculates the fair value of the reporting unit and compares the fair value of the reporting unit to its carrying value (“Step 1”). If the carrying value of the reporting unit exceeds the fair value, goodwill is potentially impaired and the second step (“Step 2”) of the impairment test must be performed. In the second step, the Company compares the implied fair value of the goodwill, as defined by ASC 350, to the carrying amount to determine the impairment loss, if any. The Company performed its annual qualitative Step 0 analysis as of April 2, 2018 and determined a Step 1 analysis was necessary due to market conditions. Based on the results of the Step 1 analysis, the Company concluded that the fair value of the reporting unit was greater than the carrying value of the reporting unit based on a methodology that utilized both an income approach and a market approach. We considered valuation factors including the Company's market capitalization, future discounted cash flows and an estimated control premium based upon a review of comparable market transactions. Our consideration of discounted future cash included assumptions regarding growth rates and margins based on our historical trends. In addition, we applied a market discount rate calculated based upon an analysis of companies similar in size. The estimated fair value of the reporting unit exceeded the carrying value by approximately 38%. We will continue to monitor our market capitalization and impairment indicators. The Company, using its best estimates based on reasonable and supportable assumptions and projections, reviews assets for impairment whenever events or changes in circumstances have indicated that the carrying amount of its assets might not be recoverable. Impaired assets are reported at the lower of cost or fair value. An accrual is made for expected warranty costs, with the related expense recognized in cost of goods sold. Management reviews the adequacy of this accrual quarterly based on historical analyses and anticipated product returns. The Company self-funds its domestic employee health plans. The Company contracts with a separate administrative service company to supervise and administer the programs and act as its representative. The Company reduces its risk under this self-funded platform by purchasing stop-loss insurance coverage for high dollar individual claims. In addition, if the aggregate annual claims amount to more than 125 percent of expected claims for the plan year this insurance will also pay those claims amounts exceeding that level. The Company estimates its exposure for claims incurred but not paid at the end of each reporting period and uses historical claims data supplied by the Company’s broker to estimate its self-funded insurance liability. This liability is subject to a total limitation that varies based on employee enrollment and factors that are established at each annual contract renewal. Actual claims experience may differ from the Company’s estimates. Costs related to the administration of the plan and related claims are expensed as incurred. Revenues and associated costs from engineering design, development services and tooling, which are performed under contract of short term durations, are recognized only after the completed performance of the service. Revenue from engineering design, development services and tooling represented approximately 2.7 percent, 2.1 percent and 1.7 percent of total revenue in fiscal years 2018, 2017, and 2016, respectively. The Company classifies costs associated with shipping and handling fees as a component of cost of goods sold. Customer billings related to shipping and handling fees are reported as revenue. Research, development and engineering expenses include unreimbursed EMS costs as well as design and engineering costs associated with the production of EMS programs. Research, development and engineering costs are expensed as incurred. Income taxes are accounted for under the asset and liability method. Deferred tax assets and liabilities are recognized for the estimated future tax consequences and benefits attributable to differences between the financial statement carrying amounts of existing assets and liabilities and their respective tax bases, as well as tax credit carryforwards. Deferred tax assets and liabilities are measured using enacted tax rates expected to apply to taxable income in the years in which temporary differences and carryforwards are expected to be recovered or settled. The effect on deferred tax assets and liabilities for a change in tax rates is recognized in the period that includes the enactment date. Valuation allowances are established when necessary to reduce deferred tax assets to the amount that is more likely than not to be realized. We utilize a two-step approach to recognizing and measuring uncertain tax positions. The first step is to evaluate the tax position for recognition by determining if the weight of available evidence indicates it is more likely than not that the position will be sustained on audit, including resolution of related appeals or litigation processes, if any. The second step is to measure the tax benefit as the largest amount which is more than 50% likely of being realized upon ultimate settlement. We consider many factors when evaluating and estimating our tax positions and tax benefits, which may require periodic adjustments based on new assessments and changes in estimates and which may not accurately forecast actual outcomes. Our policy is to recognize interest and penalties related to the underpayment of income taxes as a component of income tax provision. To date, we have not incurred charges for interest or penalties in relation to the underpayment of income taxes. The tax years 1997 through the present remain open to examination by the major U.S. taxing jurisdictions to which we are subject. Refer to Note 6 for further discussions. The Company has entered into foreign currency forward contracts and an interest rate swap which are accounted for as cash flow hedges in accordance with ASC 815, Derivatives and Hedging. The effective portion of the gain or loss on the derivative is reported as a component of accumulated other comprehensive income (AOCI) and is reclassified into earnings in the same period in which the underlying hedged transaction affects earnings. The derivative’s effectiveness represents the change in fair value of the hedge that offsets the change in fair value of the hedged item. The Company uses derivatives to manage the variability of foreign currency fluctuations of expenses in our Mexico facilities and interest rate risk associated with certain borrowings under the Company’s debt arrangement. The foreign currency forward contracts and interest rate swaps have terms that are matched to the underlying transactions being hedged. As a result, these transactions fully offset the hedged risk and no ineffectiveness has been recorded. The Company’s foreign currency forward contracts and interest rate swaps potentially expose the Company to credit risk to the extent the counterparties may be unable to meet the terms of the agreement. The Company minimizes such risk by seeking high quality counterparties. The Company’s counterparties to the foreign currency forward contracts and interest rate swaps are major banking institutions. These institutions do not require collateral for the contracts, and the Company believes that the risk of the counterparties failing to meet their contractual obligations is remote. The Company does not enter into derivative instruments for trading or speculative purposes. Basic earnings per common share is computed by dividing net income by the weighted average number of common shares outstanding during the period. Diluted earnings per common share is computed by dividing net income by the combination of other potentially dilutive weighted average common shares and the weighted average number of common shares outstanding during the period using the treasury stock method. The computation assumes the proceeds from the exercise of stock options were used to repurchase common shares at the average market price during the period. The computation of diluted earnings per common share does not assume conversion, exercise, or contingent issuance of common stock equivalent shares that would have an anti-dilutive effect on earnings per share. The functional currency of the Company’s subsidiaries in Mexico and China is the U.S. dollar. Realized foreign currency transaction gains and losses for local currency denominated assets and liabilities are included in cost of goods sold. The carrying values of cash and cash equivalents, accounts receivable and current liabilities reflected on the balance sheets at June 30, 2018 and July 1, 2017, reasonably approximate their fair value. The Company had an outstanding balance on the line of credit of $16.2 million as of June 30, 2018 and $18.3 million as of July 1, 2017, with a carrying value that reasonably approximates the fair value. The Company had an outstanding balance on the term loan of $16.3 million as of June 30, 2018 and $21.3 million as of July 1, 2017, with a carrying value that reasonably approximates the fair value. The equipment term loan is estimated to be $2.6 million as of June 30, 2018 and $3.5 million as of July 1, 2017, with a carrying value that reasonably approximates the fair value. The Company’s incentive plan may provide for equity and liability awards to employees in the form of stock options, stock appreciation rights, restricted stock, restricted stock units, stock awards, stock units, performance shares, performance units, and other stock-based or cash-based awards. Compensation cost is recognized on a straight-line basis over the requisite employee service period, which is generally the vesting period, and is included in cost of goods sold, research, development and engineering, and selling, general, and administrative expenses. Share-based compensation is recognized only for those awards that are expected to vest, with forfeitures estimated at the date of grant based on historical experience and future expectations. In May 2014, the Financial Accounting Standards Board (FASB) issued Accounting Standards Update 2014-09 (ASU 2014-09), Revenue from Contracts with Customers. The guidance in this Update affects any entity that either enters into contracts with customers to transfer goods or services or enters into contracts for the transfer of nonfinancial assets unless those contracts are within the scope of other standards (for example, insurance contracts or lease contracts). The standard’s core principle is that a company will recognize revenue when it transfers promised goods or services to customers in an amount that reflects the consideration to which the company expects to be entitled in exchange for those goods or services. In doing so, companies will need to use more judgment and make more estimates than under current guidance. This may include identifying performance obligations in the contract, estimating the amount of variable consideration to include in the transaction price and allocating the transaction price to each separate performance obligation. This Update is effective for annual reporting periods beginning after December 15, 2017, including interim periods within that reporting period. As such, the guidance is effective for the Company beginning in the first quarter of fiscal year 2019. The Company has substantially completed its review of significant customer contracts and is in the process of finalizing its implementation in accordance with the planned effective date. Remaining implementation activities are focused on improvement of additional system tools and capabilities to enable the Company to make timely and reasonable estimates of revenue during the manufacturing process, as well as the implementation and maintenance of relevant internal controls. The Company has assessed that the impact of the new guidance will result in a change of the Company’s revenue recognition model for the majority of electronics manufacturing services from “point in time” upon physical delivery to an “over time” model and believes this transition will have an impact on the Company’s consolidated financial statements upon adoption primarily as it will recognize an increase in contract assets for unbilled receivables with a corresponding reduction in finished goods and work-in-process inventory. The new guidance allows for two transition methods in application (i) retrospective approach, or (ii) modified retrospective approach. The Company will adopt the standard using the modified retrospective approach, which will result in an adjustment for the cumulative effect of applying this guidance to contracts in process as of the adoption date. Under this approach, prior financial statements presented will not be restated and the effects of the modified retrospective approach will be recorded as an adjustment through retained earnings in the period of adoption. The Company expects the opening balance sheet adjustment to increase retained earnings in the range of $0.5 million and $2.0 million. Additionally, disclosures required for revenue recognition will include qualitative and quantitative information about contracts with customers, significant judgments and changes in judgments, and assets recognized from costs to obtain or fulfill a contract. Such disclosures are more extensive than what is required under existing GAAP. In August 2016, the FASB issued Accounting Standards Update 2016-15, Classification of Certain Cash Receipts and Cash Payments. This update provides guidance on how to record eight specific cash flow issues. This update is effective for fiscal years beginning after December 15, 2017, and interim periods within those fiscal years. Early adoption is permitted and a retrospective transition method to each period should be presented. The Company is still assessing the impact of this update on its operating and investing cash flows. The Company intends to adopt the new guidance when it becomes effective in the first quarter of fiscal year 2019. In May 2017, the FASB issued Accounting Standards Update 2017-09, Compensation - Stock Compensation. This update provides guidance about which changes to the terms or conditions of a share-based payment award require an entity to apply modification accounting. The Company believes the new guidance will not have a material effect on its consolidated financial statements. The Company intends to adopt the new guidance when it becomes effective in the first quarter of fiscal year 2019. In February 2018, the FASB issued Accounting Standards Update 2018-02, Income Statement—Reporting Comprehensive Income (Topic 220): Reclassification of Certain Tax Effects from Accumulated Other Comprehensive Income. This update allows a reclassification from accumulated other comprehensive income to retained earnings for stranded tax effects resulting from the Tax Cuts and Jobs Act. The Company early adopted this ASU during the third quarter of fiscal year 2018. As a result of adoption there was a one-time impact to the financial statements to the current period only, as such prior periods were not restated. The impact of adopting ASU 2018-02 is reflected in the Statement of Shareholder’s Equity. In March 2018, the FASB issued Accounting Standards Update 2018-05, Income Taxes (Topic 740): Amendments to SEC Paragraphs Pursuant to SEC Staff Accounting Bulletin No. 118. This update, effective upon issuance, amends SEC paragraphs in ASC 740, Income Taxes, to reflect SEC Staff Accounting Bulletin (SAB) 118, which provides guidance for companies that are not able to complete their accounting for the income tax effects of the Tax Cuts and Jobs Act in the period of enactment. The impact of adopting this guidance is reflected in Footnote 6, Income Taxes. The Company operates on a 52/53 week fiscal year. Fiscal years end on the Saturday nearest June 30. As such, fiscal years 2018, 2017, and 2016, ended on June 30, 2018, July 1, 2017, and July 2, 2016, respectively. Fiscal year 2018 and 2017 were 52 week years whereas fiscal year 2016 was a 53 week year. On September 3, 2014, the Company entered into a five-year term loan in the amount of $35.0 million used to acquire all of the outstanding shares of CDR Manufacturing, Inc. (dba Ayrshire Electronics). The term loan requires quarterly payments of $1.25 million through June 15, 2019, with a final payment of the remaining outstanding balance on August 31, 2019. The Company expects to renew its term loan agreement during the first quarter of fiscal year 2019 and management believes this to be probable. The Company had an outstanding balance of $16.3 million and $21.3 million under the term loan as of June 30, 2018 and July 1, 2017, respectively. On August 6, 2015, the Company entered into a First Amendment to the amended and restated credit agreement extending the limit on our line of credit facility to $45.0 million as evidenced by the Second Replacement Revolving Note. The agreement specifies that the proceeds of the revolving line of credit be used primarily for working capital and general corporate purposes. The line of credit is secured by substantially all of the assets of the Company and matures on August 31, 2019 at which time all outstanding balances are payable. The Company expects to renew its credit agreement during the first quarter of fiscal year 2019 and management believes this to be probable. As of June 30, 2018, the Company had an outstanding balance under the credit facility of $16.2 million, $0.4 million in outstanding letters of credit and $28.4 million available for future borrowings. As of July 1, 2017, the Company had an outstanding balance under the credit facility of $18.3 million, $0.4 million in outstanding letters of credit and $26.3 million available for future borrowings. On December 28, 2016, the Company entered into an equipment term loan agreement in the amount of $3.9 million in order to further invest in production equipment. The equipment term loan is collateralized by production equipment. Under this loan agreement, equal quarterly payments of approximately $0.2 million commenced on March 31, 2017 and will continue through the maturity of the equipment term loan on June 30, 2021. Amortization of the debt issuance costs is reported as interest expense on the consolidated income statement. As of June 30, 2018, the Company had an outstanding balance of $2.6 million. As of July 1, 2017, the Company had an outstanding balance of $3.5 million. The Company has available an additional $2.1 million which can be borrowed in the future under this agreement. Borrowings under the revolving line of credit, term loan and equipment term loan bear interest at either a “Base Rate” or a “Fixed Rate,” as elected by the Company. The base rate is the higher of the Wells Fargo Bank prime rate, daily one month London Interbank Offered Rate (LIBOR) plus 1.5%, or the Federal Funds rate plus 1.5%. The fixed rate is LIBOR plus 1.75%, LIBOR plus 2.0% or LIBOR plus 2.25% depending on the level of the Company’s trailing four quarters Earnings Before Interest, Taxes, Depreciation and Amortization (EBITDA). The interest rates on the outstanding debt as of June 30, 2018 range from 4.09% - 5.00% compared to 3.22% - 4.25% as of July 1, 2017. The Company must comply with certain financial covenants, including a cash flow leverage ratio, an asset coverage ratio and a fixed charge coverage ratio. The credit agreement requires the Company to maintain a minimum profit threshold, limits the maximum capital lease expenditures and restricts the Company from declaring or paying dividends in cash or stock without prior bank approval. The Company was not in compliance with all financial covenants as of June 30, 2018 due to the loss recognized by the arbitration settlement. However, the Company obtained a waiver from Wells Fargo Bank with respect to the noncompliance as of June 30, 2018. The Company utilizes an Account Purchase Agreement with Wells Fargo Bank, N.A. ("WFB") which allows the Company to sell and assign to WFB and WFB may purchase from Company the accounts receivable of certain Company customers in a maximum aggregate amount outstanding of $25.0 million. This agreement may be cancelled at any time by either party. The Company also has an Account Purchase Agreement with Orbian Financial Services (“Orbian”). This agreement allows the Company to sell accounts receivable of certain customers to Orbian and the agreement may be cancelled at any time by either party. Total accounts receivables sold during the twelve months ended June 30, 2018 and July 1, 2017 was approximately $104.7 million and $86.5 million, respectively. Accounts receivables sold and not yet collected was approximately $2.0 million and $1.6 million as of June 30, 2018 and July 1, 2017, respectively. The receivables that were sold were removed from the consolidated balance sheets and the cash received is reflected as cash provided by operating activities in the consolidated statements of cash flows. The Company has gross tax credit carryforwards of approximately $8.7 million at June 30, 2018. Included in total tax credits carryforwards is approximately $8.0 million in research and development (R&D) tax credits. Management also has reviewed its other deferred tax assets for purposes of determining whether or not a valuation allowance may be required. A valuation allowance against these deferred tax assets is required if it is more likely than not that some of the deferred tax assets will not be realized. Based on the Company’s profitability, it has been determined that it is more likely than not that the deferred tax assets will be realized. On December 22, 2017, the Tax Cuts and Jobs Act (“Tax Act”) was signed into law. The Tax Act reduced Federal corporate tax rates effective January 1, 2018, and changed certain other provisions, many of which are not effective until the fiscal year ending in 2019. Effective tax rates for the quarter and the twelve months ended June 30, 2018, are blended rates reflecting the benefit of two quarters of Federal tax rate reductions for fiscal year 2018. These benefits were offset by discrete expenses relating to the revaluation of our U.S. net deferred tax assets, an adjustment relating to foreign exchange, and required adjustments associated with the transition from a global to a territorial tax system (discussed further below). As a result of the U.S. tax system under the Tax Act from a global to a territorial model, a deemed one-time repatriation of all accumulated earnings and profits (AE&P) in Mexico and China occurred on December 31, 2017. For purposes of calculating the toll tax associated with this deemed repatriation, AE&P pools are stratified into two asset categories, subjected to certain allowable deductions and then the net amounts are subjected to the toll tax (15.5% for cash/cash equivalents and 8% for illiquid assets). Management has previously relied upon estimates of AE&P and the related tax pools in Mexico and China in order to calculate the amount of foreign earnings that may potentially be repatriated and the resulting potential U.S. tax liability (see further discussion below). Management has undertaken formal studies of the AE&P and tax pools in both Mexico and China and has increased its provisional calculation of the toll tax liability in the fourth quarter by $0.4 million to $1.2 million. In addition to the $1.2 million toll tax described above, the Company recognized a $1.3 million discrete expense due to the revaluation of our U.S. net deferred tax assets. Offsetting these amounts, because of the shift to a territorial system of taxation in the U.S., the Company recognized a discrete benefit of approximately $1.3 million during the second quarter related to reversing its previously recognized estimated liability associated with estimated future repatriations from Mexico and China. Compliance with the 2017 Tax Act will require significant complex computations not previously required by U.S. tax law. It is unclear how certain provisions of the 2017 Tax Act will be applied absent further legislative, regulatory, or accounting clarification and guidance. Also, on December 22, 2017, the staff of the SEC issued Staff Accounting Bulletin No. 118 (“SAB No. 118”). SAB No. 118 provides guidance on accounting for the tax effects of the 2017 Tax Act and allows registrants to record provisional amounts for a period of up to one year from the date of enactment of the 2017 Tax Act. We expect to refine and complete the accounting for the 2017 Tax Act during the first half of fiscal year 2019 as we finalize the formal AE&P and tax pools studies and as additional legislative, regulatory, and accounting guidance and interpretations become available. In future years, because of the toll tax on AE&P described above, repatriations of cash will generally be tax-free in the U.S. However, withholding taxes in China and Mexico may still apply to any such future repatriations. Management has not changed its indefinite investment assertions with regards to the portion of AE&P in each jurisdiction that may be repatriated in the future. Accordingly, management estimates that future repatriations of cash from China may result in approximately $0.8 million of withholding tax. There would be no offsetting foreign tax credits in the U.S. and as such, this potential liability is a direct cost associated with actual repatriations. A similar analysis was conducted with anticipated future repatriations in Mexico. Under Mexican tax law, any previously taxed earnings from before 2014 (“CUFIN”) are not subject to withholding when monies are repatriated to another country. Based on management’s estimated future repatriations from Mexico and based on the estimated AE&P in Mexico as of December 31, 2013, no withholding tax liability has been recognized as of June 30, 2018. If in the future, estimated future repatriations exceed CUFIN, the Company will be required to recognize a withholding tax as a deferred tax liability at that time. Similar to China, this withholding would not be creditable and would be a direct cost associated with the actual repatriation. The Company expects to repatriate a portion of its foreign earnings based on increased net sales growth driving additional capital requirements domestically, cash requirements for potential acquisitions and to implement certain tax strategies. The Company currently expects to repatriate approximately $14.3 million of foreign earnings in the future. All other unremitted foreign earnings are expected to remain permanently reinvested for planned fixed assets purchases and improvements in foreign locations. During the second quarter of fiscal year 2017, the Company signed a unilateral advance pricing agreement (APA) with the Large Taxpayer Division of Mexico’s Servicio de Administración Tributaria (SAT) under an elective framework that has been agreed to by the U.S. and Mexican authorities. The APA is part of a larger program affecting hundreds of U.S. companies with maquiladora operations in Mexico. The general impact of the APA is to increase margins between the maquiladora and U.S. parent company, shifting profits to Mexico from the U.S. The APA was finalized during the fourth quarter of fiscal 2017; the overall impact to the financial statements was not material.